SOLID eliminates manual bottlenecks and errors, fast-tracking the sales-to-collections cycle. Capture the order once and the integrated SOLID workflow engine ensures successful order fulfilment, service provisioning, invoicing and collection. Choose from a range of billing periods and charge for overages or ad hoc amounts. Invoices are based on your chosen branded template and created in html and PDF formats. SOLID supports complex master-child, customer and partner relationships to cater for all aspects of your business, now and in the future. 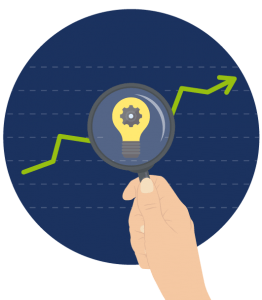 SOLID integrates sales, billing, accounting and provisioning to improve quote accuracy, eliminate billing errors, improve collections and drive service accuracy and efficiency. Every change to the system and customer database is recorded to give you a fully auditable history. All invoices are generated using branded templates and are 128bit encrypted to prevent tampering. The extensible ‘define your own billing rule’ feature is always there for any future billing model you can imagine. Send invoices and payment reminders via email or through traditional mailings. This is configured on a per customer basis. SOLID supports ESD integration to automate generating revenue Authority Compliant TAX invoices for Kenya, Tanzania and Zimbabwe. Just another example of how our software was built in Africa for Africa. 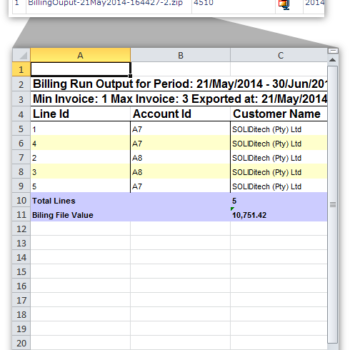 Easily invoice 10,000 lines using a 1-page attachment with Excel breakdown. Monitor which accounts are overdue and attach interest charges to those accounts. Payments are allocated to the oldest open invoice in a debtor’s account and compound interest methodologies are applied. Give your sales team the flexibility to sell at non-standard pricing while being supported by approvals and controls. Flexible pricing on a per-quote or per-contract basis lets sales teams increase or decrease pricing accordingly. SOLID is a billing engine you can count on. Run 10 – 500,000 invoice lines in around 10 minutes on SOLID. With no additional modules to purchase or development to be done, SOLID scales up or down to suit your requirements. SOLID was built to be efficient and to formalise processes through high quality automated workflows. This ensures a guaranteed consistency of process. SOLID’s automated workflows are built specifically for you and are based on your unique business rules. Build in your own competitive advantage by automating your previously manual admin tasks. This reduces operating costs and grows your bottom line. SOLID is a purpose-built unified platform where each component is inherently connected, allowing for a completely free flow of data from one functional area to another. This allows for cross-functional workflows. For example, from Customer Management, to Provisioning, to Billing and Financials. Get a high level, real-time overview of your key billing metrics through the SOLID Dashboard. Every product and service that is added or removed from a customer’s account is invoiced and accounted for. All services are automatically activated, cancelled, suspended or reactivated as required. SOLID billing software comes standard with a full set of reports to ensure that you have all the information you need to understand your business. Check whether your bill run conforms to expectations, or if it needs to be rolled back to make changes before re-running. Collate information per selectable filter such as business division, invoice status, date or period. Accurately capture revenue for all services rendered. Extract real-time data on any aspect of the billing process.